While it’s difficult to say which manufacturer’s version of Android is the best, it’s a lot easier to recognize that some skins are better than others. 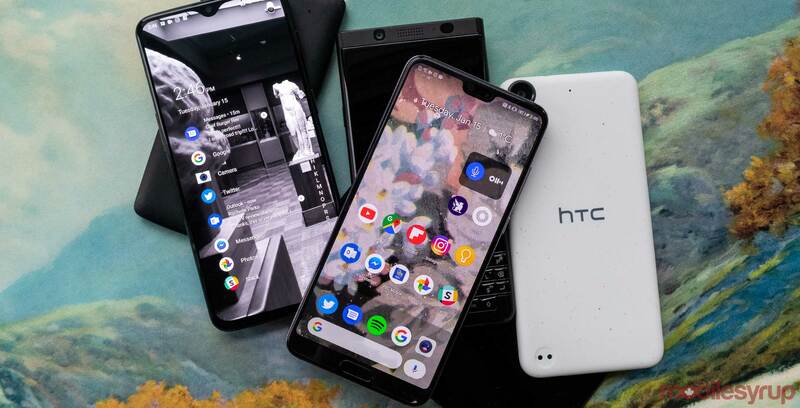 Smartphones from brands like Google and OnePlus feature stock or pure takes on Android, while manufacturers like Huawei and LG stray far from the standard Android experience with their skins. Many people hate variants of Android that are too far off from the pure Android, and that’s when they turn to custom launchers. Launchers allow Android users to customize their handset’s user interface. Some launchers can dramatically shift the style of an Android phone, while others can make the handset appear more similar to stock Android. Launchers usually let users change the home screen, the app drawer and other visual aspects of Android. On a side note, all of the launchers we’ve listed below allow you to hide apps that you can’t uninstall. This is one of the best features included in almost every launcher and can help clean up a phone’s interface. It’s also functionality that stock Android lacks. Known initially as Arrow launcher when it launched back in 2015, Microsoft’s Trojan Horse has grown to become one of the best mobile launchers around. 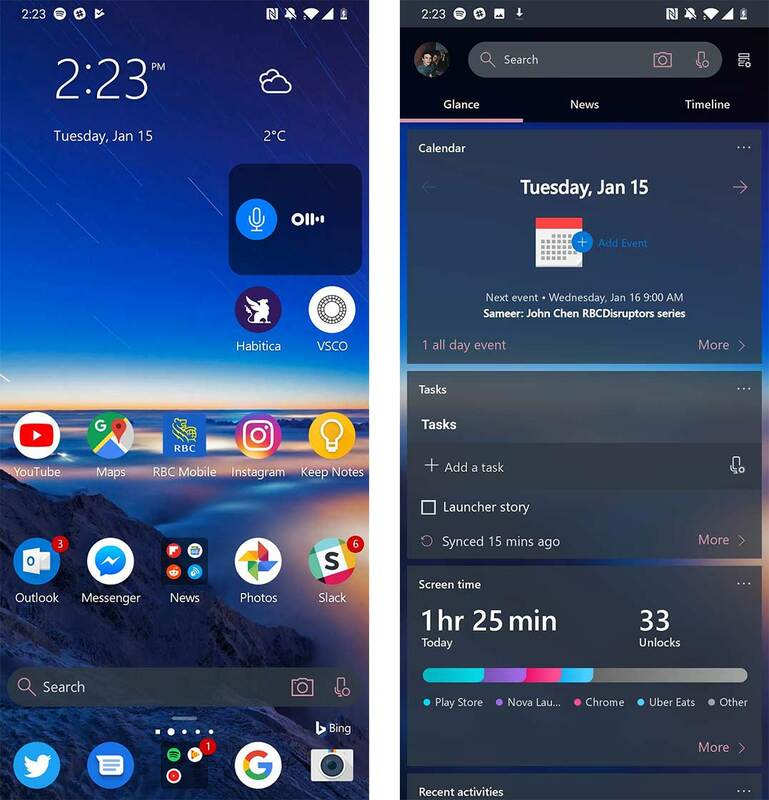 The Microsoft Launcher not only offers a visual overhaul of your phone’s home screen, it adds features for Windows PC users. On top of all that, there’s a substantial amount of customization within the launcher that makes it easy to tailor it to your preferences while still maintaining a distinct Microsoft look. To personalize the launcher, you can start by setting a slideshow of up to 30 pictures as your home and lock screen wallpapers. Alternatively, you can use the Bing picture of the day. Afterward, you can choose from light, dark or transparent themes, though the transparent option is pretty dark. Additionally, you can choose an accent colour to spice up the rest of the interface. Microsoft Launcher allows for other small customizations as well. You can alter dock icon sizes, as well as tweak the app drawer and home screen interfaces and layouts. This lets you tailor the look of your phone to your preferences. Once you make the launcher look like you want it to, you get to alter some of the other features like the ‘Your feed’ and gestures. Your feed adds screens for widgets, news and the Windows Timeline feature to the left of your home screen. 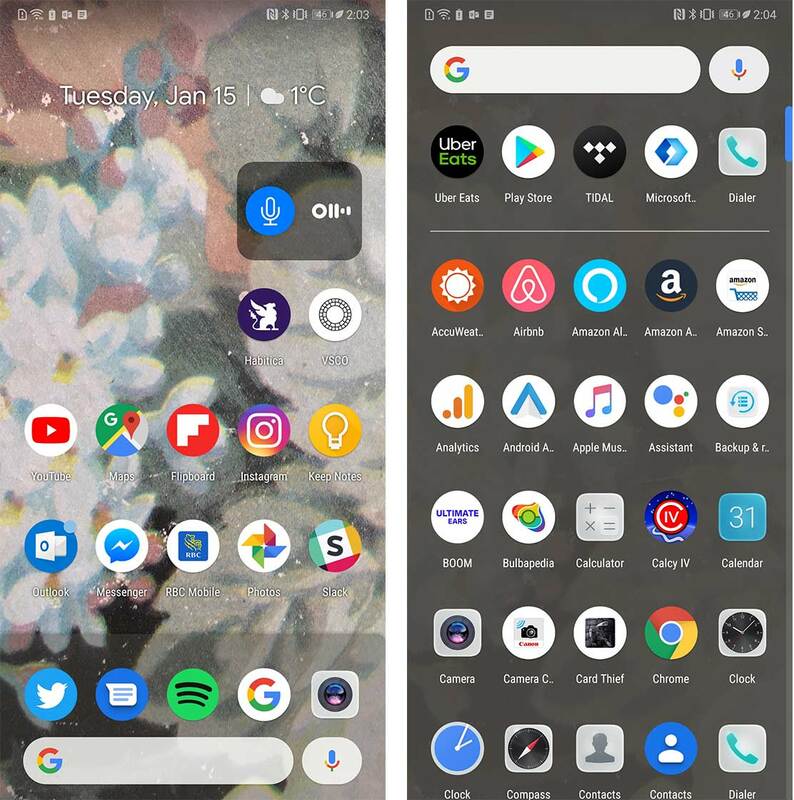 The default ‘Glance’ view is similar to OnePlus’ OxygenOS launcher, where you can add a variety of widgets. Microsoft even added a few custom widgets like a screen usage tracker and a basic task management program. Swiping left within the Glance page brings you into Microsoft’s News section. You can customize this section to only show content from topics you’re interested, but the launcher doesn’t allow you to source it to specific websites. Finally, swiping right within this menu brings up the Microsoft Timeline feature. Timeline is a Windows 10 feature that allows users to look back and see what they were working on earlier. On Android, the feature is still in beta, but it should show all of the recent activity that’s associated with your Microsoft account. 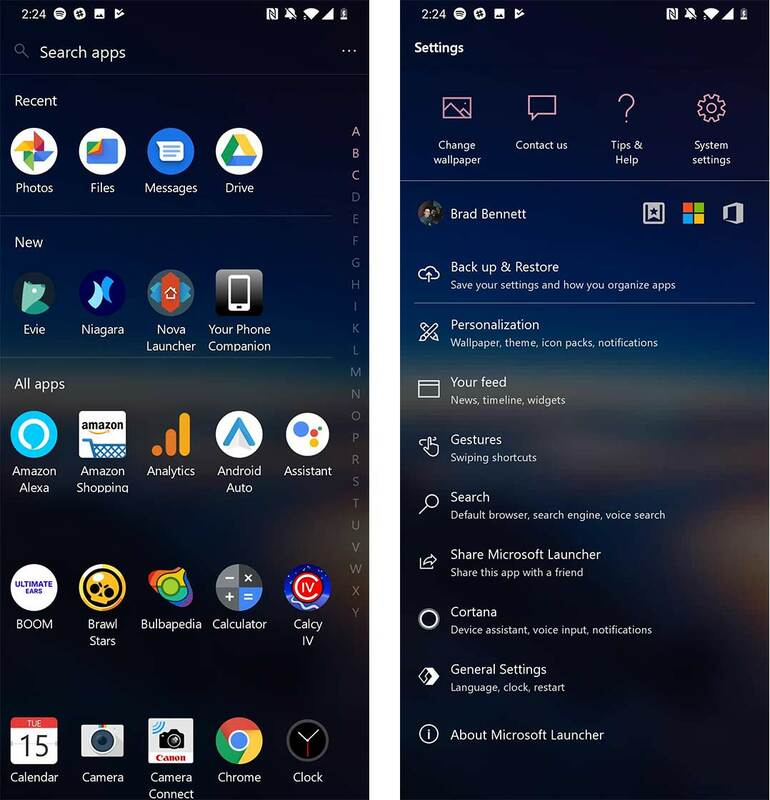 The Microsoft Launcher app drawer and launcher settings. All of these side-menu features can be enabled or disabled if you don’t want to use them. For people who use Microsoft’s digital assistant Cortana, you can enable it in the launcher’s settings menu to active with the “Hey Cortana” key phrase. This feature is still in beta, and it only works while the launcher is open. It doesn’t work inside of apps. 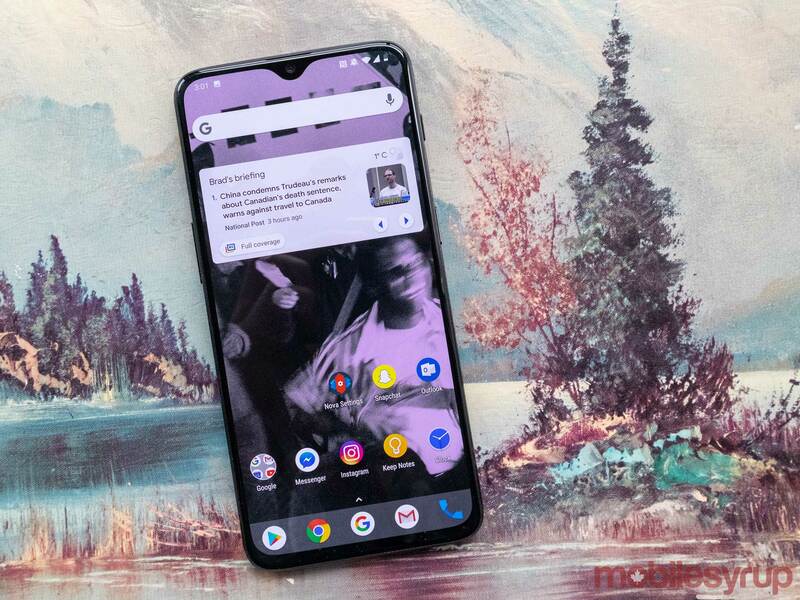 Overall, the Microsoft Launcher brings a lot of customization to the Android home screen, as well as a few features that make using it alongside a Windows 10 PC even better. To truly integrate your phone with Windows, you need the Your Phone Companion app, but the launcher is an excellent first step. Nova is the original all-star launcher. It’s one of the most recognized launchers because of its age and its ability to help users make their skins appear more like stock Android. Nova is one of the kings of customization since it lets users do almost anything they can imagine with their phone’s home screen. 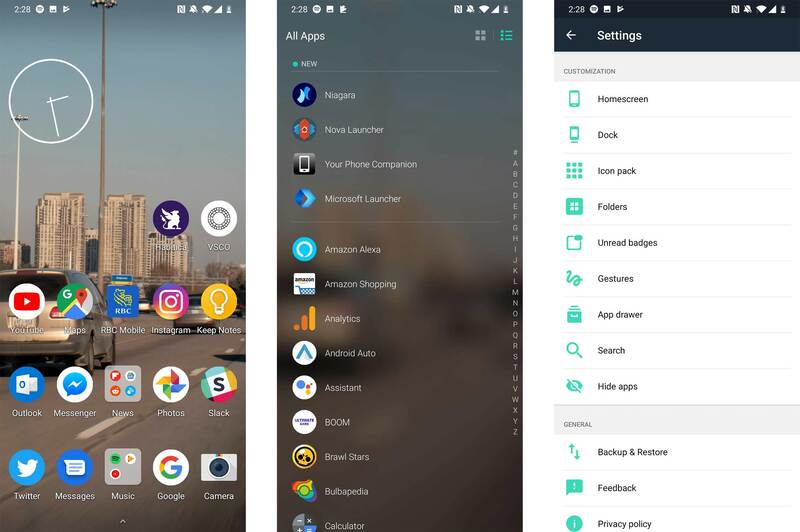 The launcher highlights customizations with the ability to adjust padding around app icons, the look of the search bar, the scroll effect, the style of page indicator on the home screen and so much more. While I love the almost unlimited customization of Nova launcher, there is one big caveat. To get the most out of it, you need to buy Nova Launcher Prime, which costs $5.99 CAD. Nova Launcher home screen, app drawer and launcher settings. One of Nova Launcher’s cooler features is that it has a built-in night mode that users can set to come on at custom times. It’s also possible to set the night mode to turn on and off with sunset and sunrise. Users can also add in a handful of custom gestures to the launcher to make navigating the home screen more fluid. Overall, if you want a reliable launcher that has a wonderful amount of customization, then Nova launcher is right for you. You can download Nova Launcher for free here, and buy Nova Launcher Prime here. Niagara Launcher gets rid of most parts of any traditional launcher. There’s no app drawer or way to organize your apps on the home page and no specialized widgets of any sort. Niagara is streamlined and minimalistic, which is what I like most about the launcher. Users can pick their favourite apps so that they show up on the homepage. 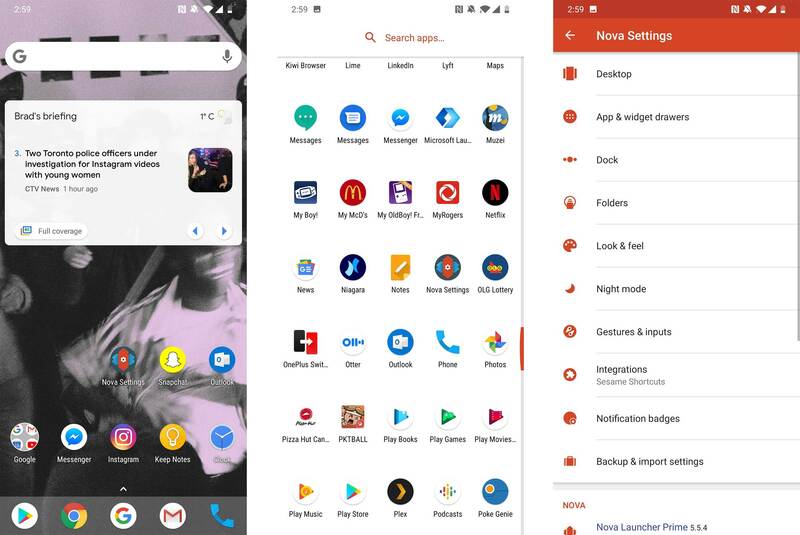 Depending on how many you have on the homepage, there’s an option to allow the launcher select the apps you use the most often to also show up on the home screen. To access your apps, there’s a vertical alphabet on the right side where you can slide down with your finger to search for apps alphabetically. This means that if you don’t know the name of the app you’re looking for you might be scrolling for a long time. You can also hide the alphabet until you’re ready to use it. Additionally, there’s the option to add a Google button for quick access to Google Search. It’s also possible to set the launcher to show the weather forecast at all times. I also enjoy the media player that appears below the time and the ability to preview, reply and swipe away notifications without actually going into a messaging app. The way that Niagara handles notifications is one of the best parts of the app since it’s such a refreshing take on the formula. Instead of a small bubble attached to the app, Niagara places the notification’s content beside the corresponding app. And that’s pretty much it, which is the charm of Niagara. The Niagara launcher is completely free but is technically “unreleased.” You can still find it on the Google Play Store, however. Then there’s Evie Launcher, another streamlined launcher. 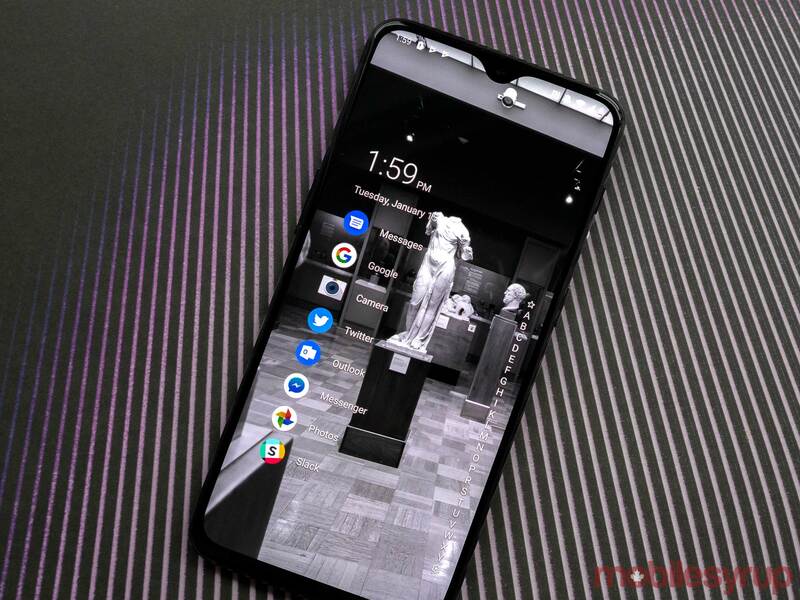 This one Dean particularly liked when using it with phones like the Huawei P20 and Asus ZenFone 5Z as both devices feature launchers that look and work differently than the stock Android. Similar to stock Android, Evie features a home page and app drawer that users can access by swiping up. In the app drawer, users can organize their apps either in a vertical column or rows. Either way, similar to the Niagara launcher, in the vertical column view apps are organized alphabetically. 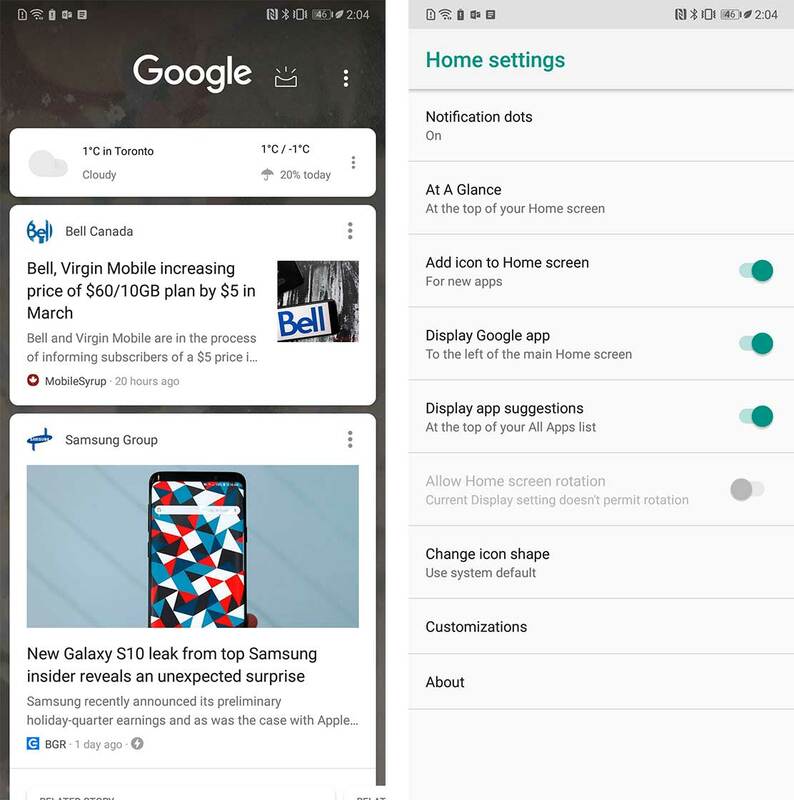 As for the home page, those who use this app can choose different widgets and add the apps they want to the home page, similar to any basic launcher. What’s interesting about Evie is all of the other customizations that the app gives users. 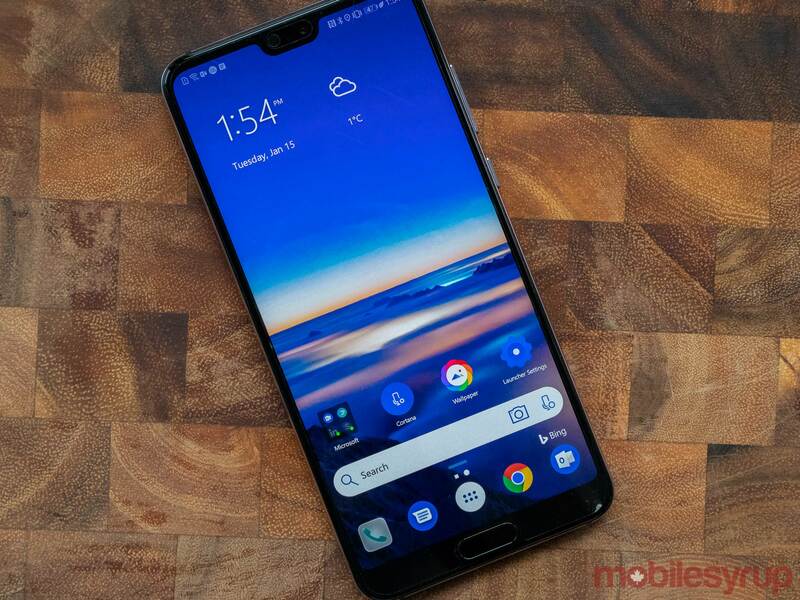 Tapping on the home button allows users to quickly search for their desired app, or pick from their frequently used apps, or browse the internet. Evie Launcher offers quite a bit of customization hidden within the settings menu. 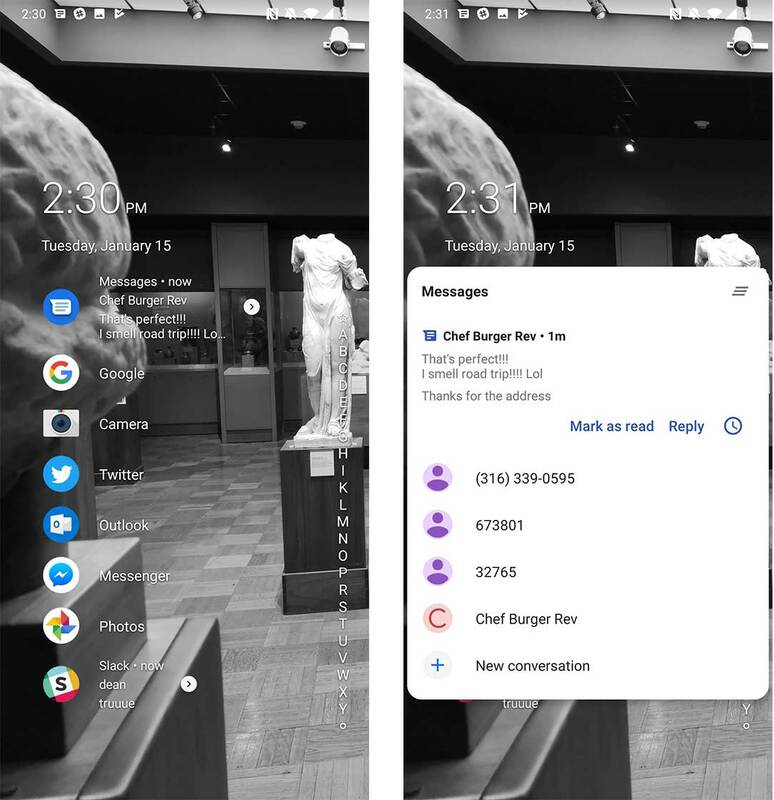 Diving into the setting menu lets users add a search bar to the home screen, create shortcuts that you can open with gestures, redesign the app drawer, change the size of apps on the home screen and add notification badges. Evie even has a newsfeed functionality that replaces the Google Feed when you swipe right on the Home Screen. Evie Launcher is free on the Play Store, with an easy option to become a Beta Tester. While Nova and Evie both go in the right direction, they’re still missing Google’s stock Pixel Launcher finesse. 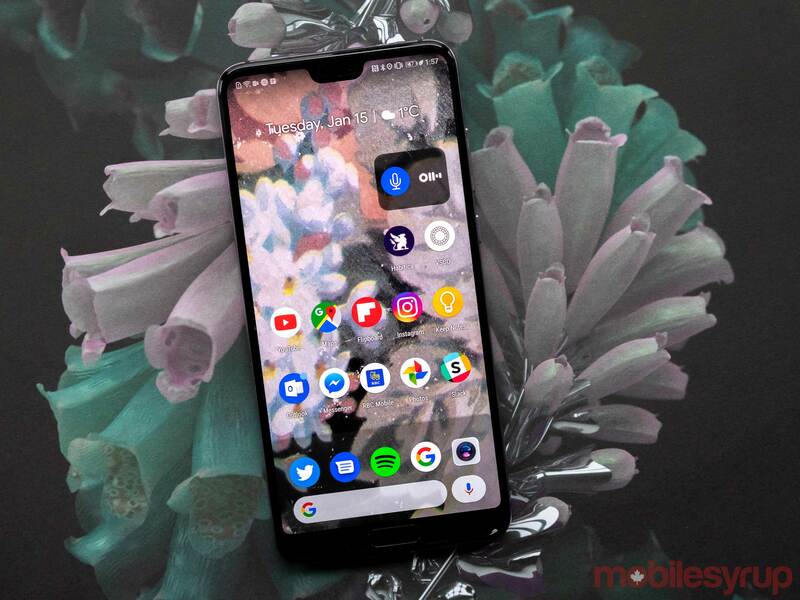 If you’re dead set on making your phone look as close to Google’s modern design as possible without rooting, then Pixel Launcher is the way to go. Be warned though — we’ve encountered issues trying to install some Pixel Launcher APK files. For the best results, I’d recommend finding one online by Google searching the name of your phone and then the keyword Pixel Launcher. Ideally, you should be able to find one that supports some minor customization tweaks, and Google News tucked to the left of the home screen. The version we found works well on both the P20 Pro and the OnePlus 6T. As always, download APK files at your own risk. Another great thing about the Pixel launcher is its simplicity. While launchers from Microsoft and Nova offer heavy customization and additional features, it’s easy to ignore many of their features since setting them up can be overwhelming. Once you get the Pixel launcher set up all you need to do is choose a light or dark theme and then you’re good to go. There are also apps in the Play Store that can alter the look of your notifications. Both Powershade and Material Notification Shade bring a customizable yet stock-looking notifications to any Android device. While we can’t say definitively which is the best launcher, we can point out that the four launchers that we chose all have high scores in the Play Store. Each one in this list sits above 4.5 out of 5. Our top four launchers are among the first search results you’ll see when you type ‘launcher’ into the Play Store. We also chose these specific launchers because we’ve personally used them and enjoyed how they work. 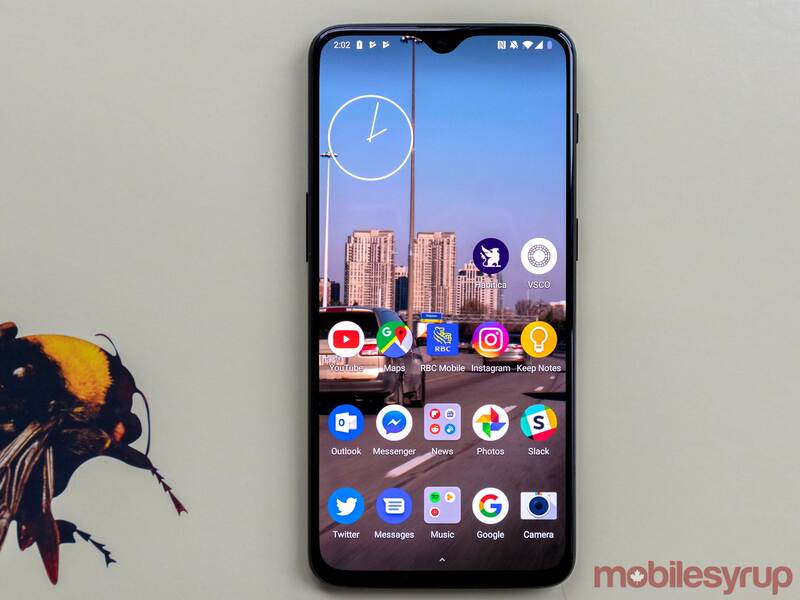 While our honourable mention is quirky and potentially not the best smartphone launcher out there, it should fall into the interests of someone seeking to use the Pixel launcher on smartphones like the Huawei Mate 20 Pro or even the Samsung Galaxy Note 9. We know that there are tons of other launchers out there like Hyperion, the Material Design-inspired Lawnchair Launcher and the iOS 12 Launcher, but after using those launchers we still prefer our chosen four. Let us know in the comments below what are your favourite launchers are.